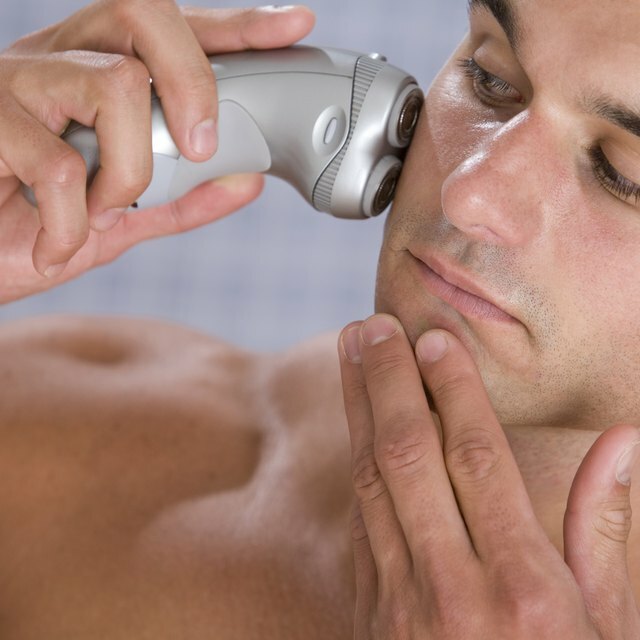 Electric shavers are less irritating to the skin. Electric shavers work differently from conventional blade razors by using a scissor-like cutting action, instead of direct blade-to-skin contact. The hairs enter the perforated screen of the razor and the moving blades on the inside of the electric razor sever them at that point. These blades are connected to an oscillating motor that moves them in a circular motion against the foil between the shaver and your skin. Since the blade is not grazing the user's skin, but rather the inside of the razor, they are less irritating to the skin. The term electric refers to how the blades move as a result of power from electricity. These razors can be fueled by a corded or battery-powered source of electricity. Many modern electric shavers use rechargeable batteries. These electrical components are water resistant and safe to use with water for cleaning. Most electric shavers are dry, meaning that they do not require lubrication with shaving cream or water. Because the blades are not sliding over your skin, electric shavers are less likely to cause irritation compared to normal razors. There are also some wet and dry hybrid electric shavers that do both. There are two types of electric shavers: foil and rotary. Foil shavers work by moving a razor back and forth under the foil or screen. This screen has perforations or holes that allow the hair go fall through. These shavers contain up to four rows of blades that are arranged along a line. The blades move back and forth, cutting any hair that pokes through the perforations in the foil. Different foil shavers can contain a different number of foils. These multiple foils are laid on top of each other, covering the blades. Foil shavers with two foil layers are called double foil shavers. Foil shavers with three foils are called triple foils. Rotary shavers work by having round foils that are held in place by springs. These springs allow the foils to pivot to conform to the curves of the person’s face. Under these foils are wheels with blades on them. These wheels spin, cutting hair that poke through the foil perforations. The pieces of cut hair fall into the hollow parts of the razor, and the skin is left free from direct blade-to-skin irritation.